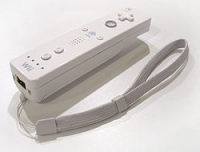 Description: The first version of the Wii remote has the original non-locking style wrist strap, and does not come with the silicone remote jacket. Although Nintendo did offer the remote jacket for free, at a later date to customers who had purchased a launch model Wii. Part # "RVL-003" is marked on the bottom. 07-17-2018 gonif Description The first version of the Wii remote has the original non-locking style wrist strap, and does not come with the silicone remote jacket. Although Nintendo did offer the remote jacket for free, at a later date to customers who had purchased a launch model Wii. Part # "RVL-003" is marked on the bottom. 10-16-2012 tpugmire Description The first version of the Wii remote has the original non-locking style wrist strap, and does not come with the silicone remote jacket. Although Nintendo did offer the remote jacket for free, at a later date to customers who had purchased a launch model Wii. 10-16-2012 tpugmire Description This version of the Wii remote has the original non-locking style wrist strap. This is a list of VGCollect users who have Nintendo Wii Remote - White (Launch Model / Non Locking Wrist Strap) in their Collection. This is a list of VGCollect users who have Nintendo Wii Remote - White (Launch Model / Non Locking Wrist Strap) in their Sell List. This is a list of VGCollect users who have Nintendo Wii Remote - White (Launch Model / Non Locking Wrist Strap) in their Wish List.